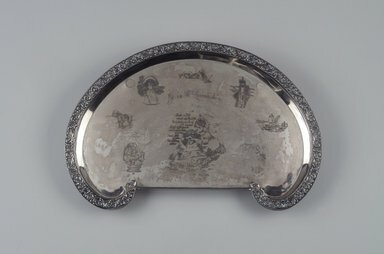 Kidney-shaped silver-plate tray with nursery rhyme decorations. Tray raised on two ball feet on underside and flat vertical strip across front edge; tray bottom slants down slightly from front; everted rim around curved edges decorated with repousse leaf and scroll pattern. Bottom of tray etched with pictures and verses from nursery rhymes. In center, scene of two children at foot of hill with spilled pail and verse "Jack & Jill / Went up the hill / to fetch a pail of / water/ Jack fell down / and broke his / crown / And Jill / came / tumbling / after." Smaller vignettes surround main image, clockwise from left: little boy seen from 3/4 rear view, seated in corner with verse "Little Jack Horner / sat in a corner / Eating his Christmas pie"; horse with saddle; crying shepherdess with verse "Little / Bo-Peep / has lost / her sheep / and cant / tell where / to find/ them / Leave them / along, and they'll / come home, / wagging their / tails behind them"; two kittens playing (in center at top of tray); tall grandfather clock with mice and verse "Hickory dickory / dock / The mouse ran up / the clock / The clock struck / one / The mouse ran / down / Dickory / dock. "; Humpty Dumpty seated on wall playing banjo; old woman at open cupboard with begging dog at her feet with verse (partially worn) "Old Mother / Hubbard she / went to the cupboard [to fetch her poor doggy a bone … ]." Condition: Good; mild overall tarnish and scratching; some denting around tray, especially above ball feet.